I’m in a car crossing Ohio today. So there’s that. My brother, of whom I am very proud, is a broadcaster for the Fort Wayne Tin Caps this summer, and I am off to visit him. The Tin Caps ballpark, Parkview Field, has been voted one of the top ten ballparks for vegetarians, plus on Saturdays they have fireworks! I am very excited for the game tomorrow. This past Tuesday was the Feast of St Ignatius Loyola, an important day for those of us associated with Jesuit ministries. 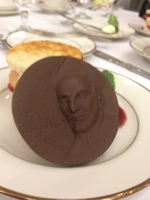 It was a very exciting day, but I was most moved by its conclusion: being served a chocolate Ignatius-face for dessert at a celebratory dinner. As a vegetarian, I feel excused from having an opinion on Chick-fil-A. I have never eaten at one, but I think that I once went into one in Tallahassee, while my friends looked for something to eat at our tailgate. We were there for BC-FSU. While I’m on the topic of cities that didn’t impress me, we crashed last night outside Youngstown, OH, after dining in Pittsburgh just to say we had. This morning we went off in search of more toothpaste, and had a heck of time finding a grocer or convenience store. There were plenty of gun shops and fireworks vendors, though. This Indiana adventure is the first roadtrip for my honey and me. After eight hours in the car yesterday, I am convinced our love can survive anything. We will have almost twelve hours on the way back, so maybe I shouldn’t speak so soon. I’ll tell you one thing though. The man packs a good cooler. We have not lacked for snacks or seltzer, and avoiding hunger seems to be a key for getting along. I started composing a rant about not being able to find an NPR station that suits me out here. Before I could finish it I punched myself in the face for being a stereotypical east-coast ivory-tower turd. Just about a week ago I began a four-day run of an opera. The day after the opera closed I was up at 5:30 am to start working on a four-day conference. 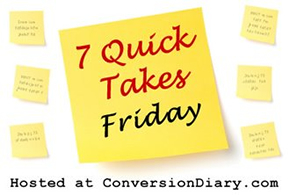 At 8 am on the last day of the conference, I had already finished my tasks for the day, and was on the road to meet my sweetheart and head off on a four-day roadtrip. I know that only adds up to 12 days, but my guess is by Sunday night it will have felt like a lifetime. How was YOUR week? Crazy? Quiet? Thanks for reading everybody – have a great weekend! Love it, Meg! Welcome to the Midwest. 🙂 Love the avoiding hunger comment. And I don’t know what type of phone you have, but there’s an NPR app that will locate stations in whatever area you’re driving through. I use it all the time. Have a great trip! Thanks! We thought about swinging up to Michigan but convinced his friends from there to come to us. I’m getting a little sick of the car so I’m glad we won’t have to add on that extra leg. Next time! Have fun on your adventures!!! Thanks! We don’t have snow to worry about, but I’m still a little apprehensive about the drive back. Ignatius chocolate, I like that! 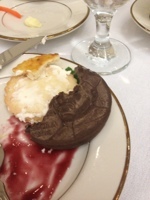 It was delicious, but unnerving. A friend described it as “sacrilicious”.